Today marks a milestone for my husband and I. Anniversaries are such a sweet time. Remembering the past, enjoying the present and looking forward to the future... and I do. I am so excited about spending the rest of my life with this special man of mine! Speaking of remembering the past, I've got a little story for you. The rock you see above is one that is on the side of the mountain that we travel up and down whenever we are going into the 'city'. My whole life, that rock has been an eyesore. People spray-paint vulgarities on it constantly and if it isn't vulgar, it is just stupid. Making me cringe when we see it. Well, I guess I had fussed about that rock enough that my creative husband took action one year for our anniversary. We went into town one day and when we came back up the mountain, I saw what you see above. Talk about surprise. I laughed and cried and was completely shocked. He went to paint the rock after work one day in the broad daylight. He wore a hat because he shaves his head and the sun around here in July is brutal. 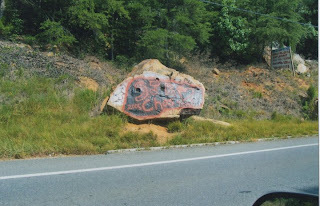 He was painting and a lady going down the mountain sees him and calls the police reporting that a 'young punk' was spray-painting the rock... again! The police show, give him a bit of a hard time and eventually let him leave. The lady who called him in was from our church. LOL! She didn't recognize him because he was in the hat and shorts. She felt SO terrible for telling on him the very next day at church we were given an anniversary card with some money in it... she apologized for turning him in and insisted that we go out for dinner 'on' her and hugged our necks, apologizing all the while. She was such a dear, dear lady. I can hear her laugh even now. She's been in heaven for many years, but she gave us a big giggle just before she left. I love you more today than ever. Happy Anniversary, Chas and Shannon! Great story. Happy Happy day to both of you. Happy Anniversary! What a sweet story, it made me smile.